With the Oculus Rift release mere months, away the tech world is gearing up for a potential virtual reality revolution. 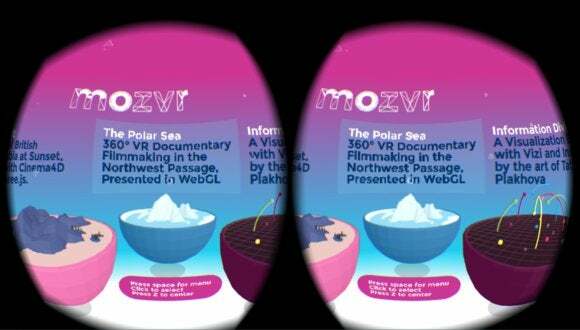 Earlier this week, as part of Mozilla's 10th anniversary, the organization launched MozVR.com, an experimental site to promote and assist in tailoring web experiences for virtual reality. On the site, developers will find links to GitHub where Mozilla is sharing code, tools, and tutorials for working on web VR. There are also several VR web-based demos including a fly-over of coastal British Columbia in Canada, a tour of the Arctic, a data visualization, a VR motion control demo for the web from Leap Motion, and an episode of Talk Chat Show Thing, a talk show filmed in VR. Why this matters: Virtual reality for the mass market has long been a dream of the tech industry. But only now, between falling component prices and the rise of the Oculus Rift, does that goal finally seem possible. As one of the leading advocates for the open web, Mozilla wants to make sure the Internet is equipped with native experiences for a potential VR revolution. Anyone can visit MozVR and view the standard version of the site, but to get to the VR experiences you need a VR-enabled version of Firefox. Mozilla first introduced a VR-ready version of its browser in June and you can download the latest VR-friendly build on MozVR.com. Mozilla's recently released Developer Edition browser and the standard nightly releases should also work. Beyond the new test browser, you'll also need an Oculus Rift headset, which is currently available as a developer kit. Mozilla says it plans to be device agnostic towards VR headsets in the future, but for now the site is only meant to work with the Rift. If you've got all the gear to try out MozVR.com as it was intended, Mozilla says you're in for an interesting experience where "clicking a link becomes like teleportation, as one VR world dissolves seamlessly into the next."